Happy hour starts at 6pm-9pm. 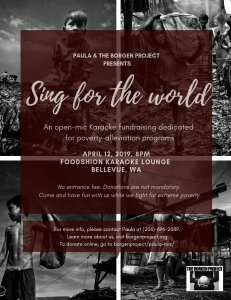 On behalf of The Borgen Project, a non-profit organization dedicated to fighting against extreme poverty, we are holding a Karaoke fundraiser event this Friday, April 12th at 8pm-11pm in Foodshion Karaoke lounge in Bellevue, Wa. See you all there!